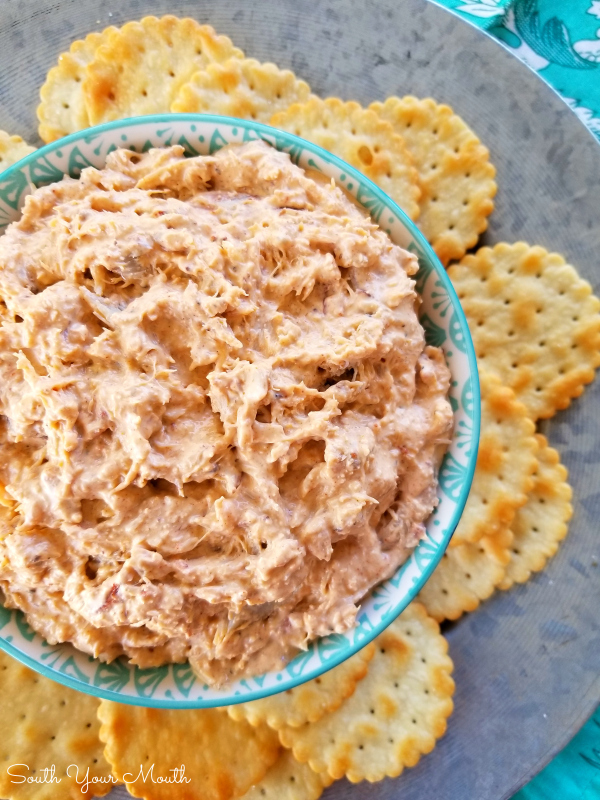 Kick your party up a notch with this fun but simple Cajun spread recipe made with crab meat - serve hot or cold! I set a twenty dollar bill on fire the last time I made this. And I thought of sunshine and rainbows and sang Kumbaya while I watched it burn. It was really a great time. The best. 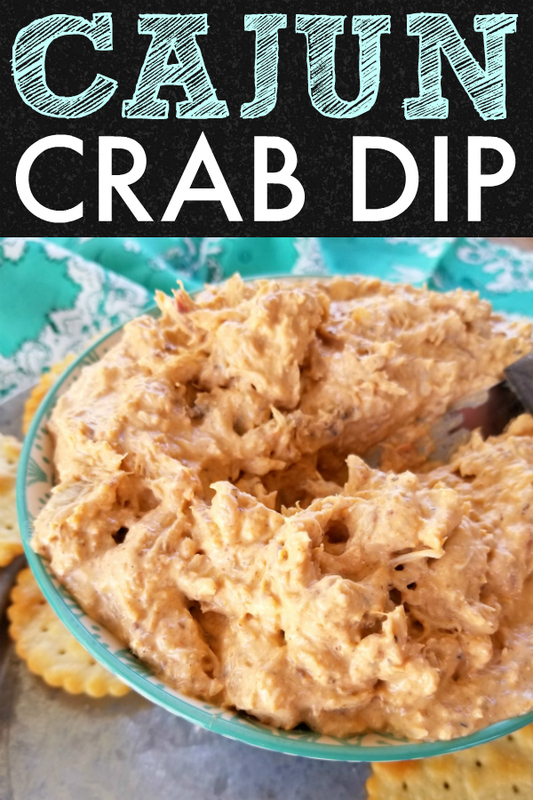 We were headed to our friends house for an oyster roast so I decided to bring crab dip because I thought that sounded like the perfect appetizer to go along with the oysters! I ran out to the store the night before to buy the ingredients and set out to whip up a batch that morning. 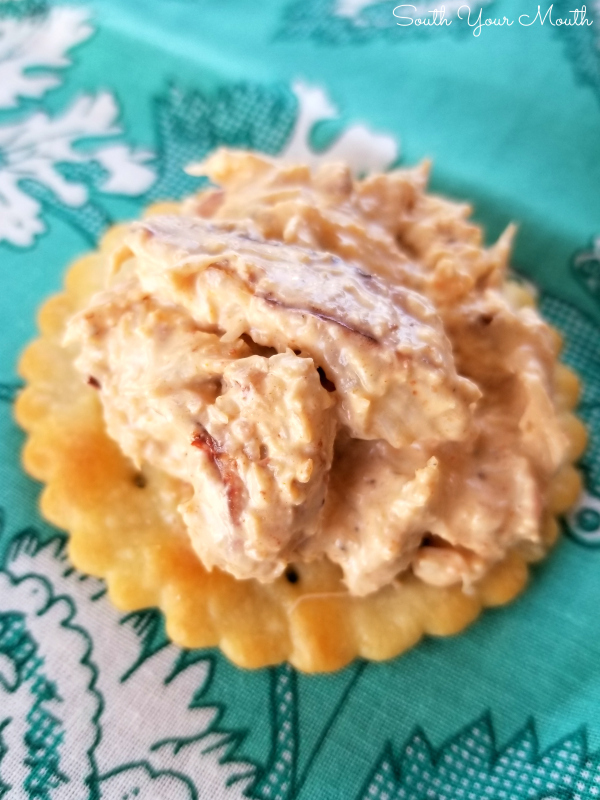 I mixed the cream cheese and other ingredients together, tweaked everything for seasoning then reached for the can of crab meat… which was sitting on the counter. Where I’d left it out overnight. I tried to rationalize a way that it might still be good by literally going to see what we had the thermostat set at (67 in the winter) and counting the hours it had set at room temperature. I opened the can and smelled the crab meat, which smelled…. like crab meat… so that didn’t help. It didn’t take me long to come to my senses and throw it out but I will admit, it was hard to dump all that hard-earned money down the drain. Oh well, better safe than sorry! I just ran back to the store and bought more. I ain't gonna lie, though, it hurt. It hurt meh good! The way I have the recipe written is exactly how I make mine but you can add minced onion or celery if you like a little crunch. 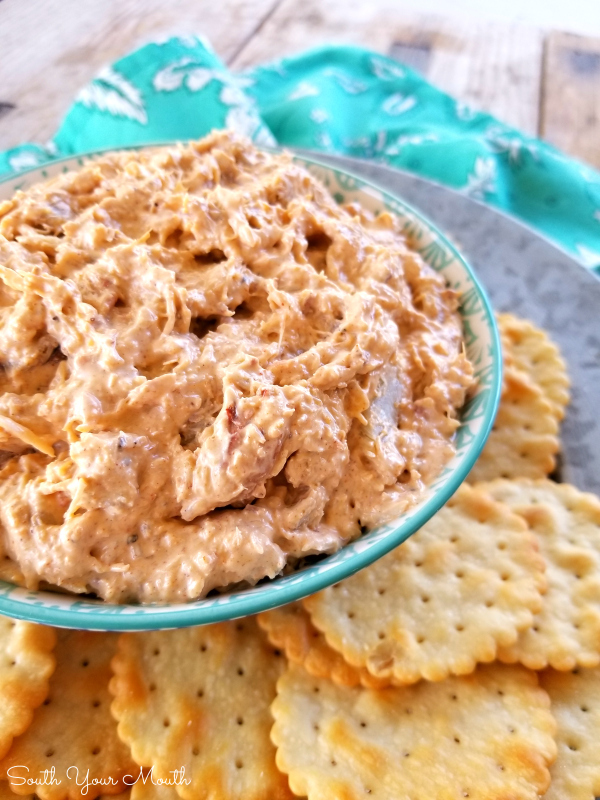 You can also add a little shredded cheese if you’d like this to be more like a spread. You could also bake this in a small crock at 350 degrees for about 30 minutes (or until bubbly) if you’d prefer a warm dip. And if you’re not a fan of Cajun cuisine, substitute Old Bay Seasoning for the Cajun seasoning! You can really make this yours! Just use my recipe as a base then jazz it up to suit your fancy! 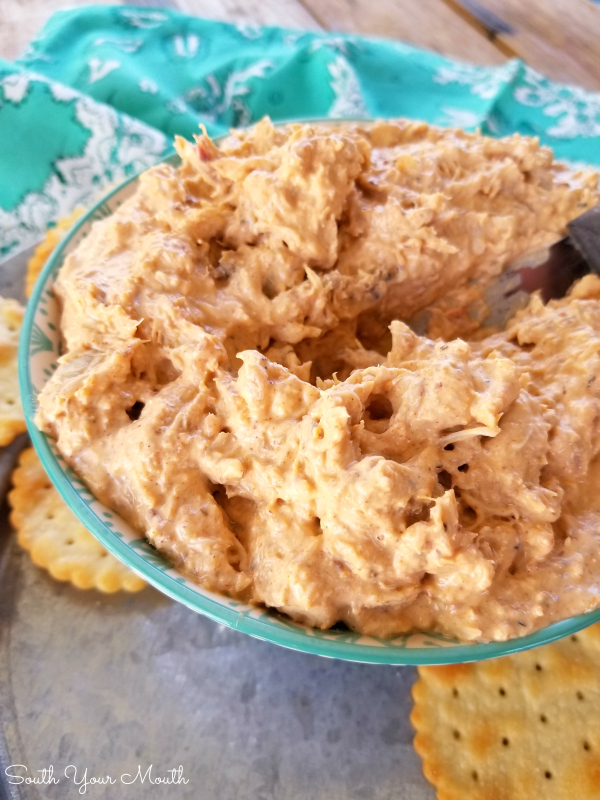 Combine cream cheese, mayo, 3 teaspoons prepared horseradish, 3 teaspoons Cajun seasoning and hot sauce then mix until smooth and creamy. Taste for seasoning then add more horseradish, Cajun seasoning and/or salt if desired. Gently fold crab meat into cream cheese mixture. Refrigerate until ready to serve. Serve with crackers. I typically use canned crab claw meat in this and can readily find 16-oz cans in the seafood department of my grocery store. I use 5 teaspoons of both the horseradish and Cajun seasoning because I like the kick but the amount you use it entirely up to your taste. I use McCormick’s Cajun Seasoning. Some Cajun seasoning blends may have more/less salt or other ingredients which is why I suggest starting with just 3 teaspoons then adding more if desired. You can serve this hot too (though I prefer it cold). Spoon spread into a small oven-safe dish then heat in the oven until bubbly. If you don’t like hot sauce, substitute with 1-2 teaspoons lemon juice. 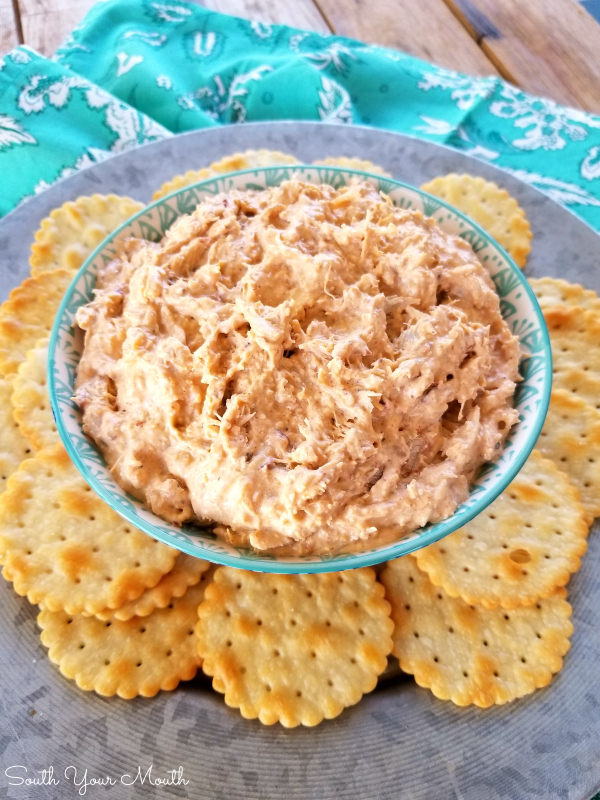 We need the acid from the hot sauce or lemon juice to balance the richness of the crabmeat and cream cheese.